Rumors around the automotive water cooler suggest that Toyota Racing Development (TRD) is currently developing a supercharger package for the Toyota GT86 and the Scion FR-S that would be offered via their aftermarket performance parts division – a modification which would go a long way in helping the sporty rear drive Scion keep pace with the other rear wheel drive sports cars in the US market. The Scion FR-S, Toyota GT86 and Subaru BRZ are rear wheel drive sports cars powered by a 2.0L Boxer engine that churns out 200 horsepower and 151lb-ft of torque. While those power specs might seem a little light for the American rear drive performance segment, the ultra lightweight “ToyoBaru” sports cars are designed to be supreme handling cars more than incredible drag cars. The result is a car that is an incredible amount of fun to drive – especially when hitting the corners hard – but those who spend much time on the quarter mile may have a hard time keeping up with the Jones. That could all change if Toyota Racing Development is really working on a supercharger package for the Toyota GT86 overseas and the Scion FR-S here in the US. Nothing is known about the possible TRD supercharger kit for the Scion FR-S but considering that it would be an aftermarket accessory rather than a production component – there wouldn’t be any real worry about the impact of this blower package on fuel economy. That being said, there is a good chance that TRD could squeeze enough power out of the 2.0L Boxer 4-cylinder to make a real difference in the performance capabilities of the FR-S without having too much of a negative impact on the overall fuel economy capabilities. There have long been rumors that Subaru is working on a high performance turbocharged version of the engine used in the Scion FR-S, Toyota GT86 and Subaru BRZ that would most likely wear the STI name. Other high performance products from Subaru sporting the STI badge have called upon improved braking and handling characteristics but more importantly- the likes of the WRX STI have offered considerable power gains from their specially tuned turbocharged motors. Based on the fact that Subaru designed the 2.0L Boxer engine under the hood of the BRZ and FR-S combined with the company’s success with force induction performance engines – it comes as no big surprise that they are working on a turbocharged BRZ performance model. However, you have to question why the mechanically identical Scion FR-S wouldn’t benefit from the same turbocharging setup. Toyota Racing Development has had great success in the past in designing supercharger kits for various models in the Toyota family so the company could call upon that experience to offer a new, more significant power adder for their rear drive sports coupes. TRD already offers items like air intake and exhaust packages that improve the output of the Boxer engine but a supercharger could easily get the FR-S up into the 300 horsepower range and – with the lightweight design of the FR- 300hp would be enough to really bring this car to life. 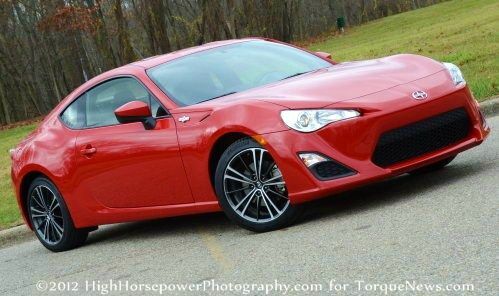 The FR-S is already a ton of fun to drive but with an extra hundred horsepower, the sporty Scion coupe would be able to present a much more formidable challenge to the likes of the Ford Mustang and the Chevrolet Camaro. Rumors also indicate that this TRD supercharger would be unique to the Toyota GT86 and the Scion FR-S which is curious considering that these two are mechanically identical to the Subaru BRZ but if Subbie owners could go out and buy a factory turbocharged BRZ STI, perhaps they simply wouldn’t bother buying the TRD blower setup for their car. However, there is a good chance that unless TRD finds a way to make it so that their supercharger simply doesn’t bolt up to the engine of the Subaru BRZ – we will still see at least a few blown Subaru sports coupes with TRD parts.